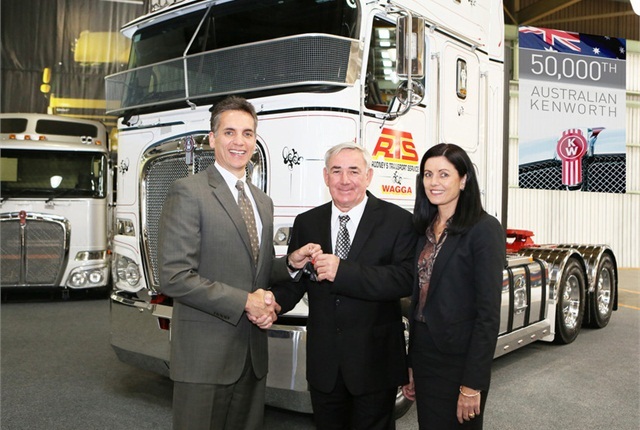 PACCAR Australia has delivered its 50,000th Australian-designed and manufactured Kenworth truck at its Bayswater plant in Melbourne. Mike Dozier, Managing Director of PACCAR Australia, handed the keys of a K200 prime mover to long-standing Kenworth customer Peter Rodney, managing director of Rodney’s Transport Service (RTS), a privately owned trucking company in the Riverina. Dozier said Kenworth’s achievement in manufacturing 50,000 trucks was a major milestone, not only for the company but for Australian manufacturing. Kenworth has designed and manufactured uniquely Australian trucks since 1971, and it has been the number one heavy-duty truck supplier since 2001, according to the company. Kenworth trucks are the mainstay of Australian transport businesses of all sizes, from large fleets to single owner-operators. Its trucks are also exported to New Zealand, Japan, Thailand and Papua New Guinea. Dozier said Australia has a diverse range of operating environments unlike anywhere else in the world. Trucks must deal with extreme heat in remote, dusty mines and across deserts. Others must haul loads that are two or three times heavier than overseas, and on rough and unmade roads. Often trucks are required to perform an inordinate amount of hours, some as much as 24 hours a day. Dozier said Kenworth’s 42 years of local manufacturing has a significant ripple effect that has benefited many Australian industries. As part of its manufacturing commitment, Kenworth has made a substantial investment in design engineering. This enables it to purpose-build trucks with extremely short lead times, according to the company. Established in 1992 near Wagga Wagga, RTS has grown from a small business running three trucks to a major regional transport operation with two depots boasting large storage facilities for up to 100,000 pallets of stock and 20,000 tons of grain harvested from the Riverina. The company operates a Kenworth fleet of 104 prime movers configured with tanker, tautliner and tipper trailers for handling a diverse range of duties. The trucks haul everything from general and container freight to industrial products, scrap metals and waste throughout the eastern states and SA. In addition, the Kenworths transport livestock and a variety of agricultural products, including fertilizers, lime, gypsum, and grain.